1821,BRAZIL. 960 Reis, 1821-R. NGC MS-62.KM-326.1; LDMB-P479. Lightly toned with some luster. 1819,BRAZIL. 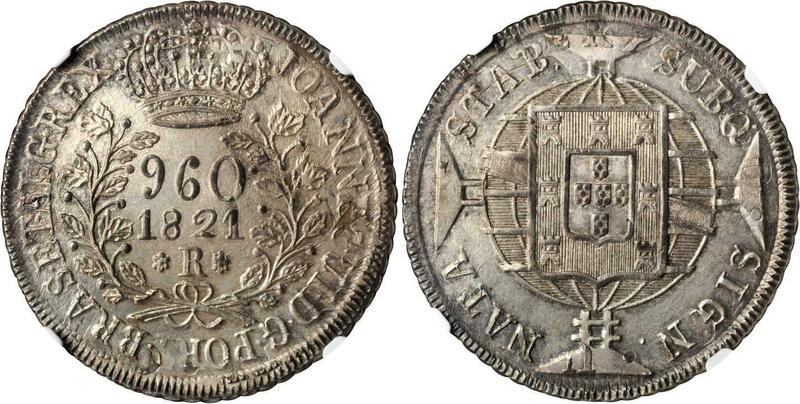 960 Reis, 1819-R. NGC AU-58.KM-326.1; LDMB-P477; Gomes-J622.05. 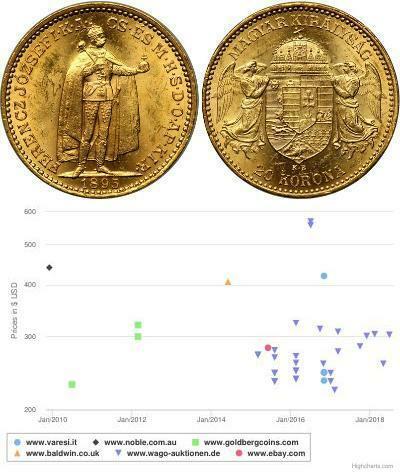 Radiant cross struck over Santiago Chile Peso. Light, attractive toning. 1820,BRAZIL. 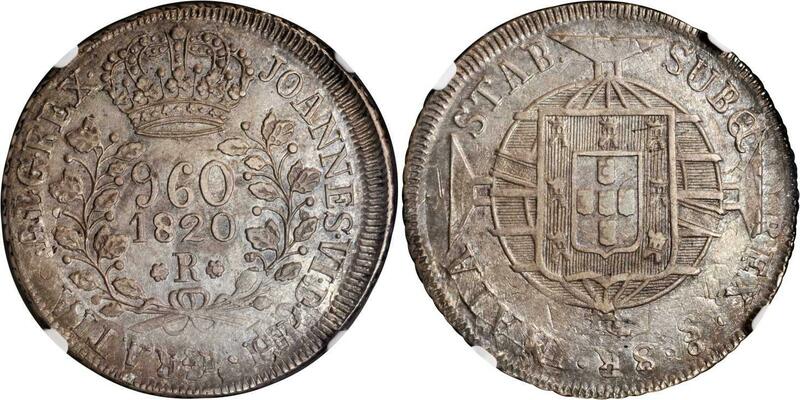 960 Reis, 1820-R. NGC MS-61.KM-326.1; LDMB-P478c. RARE variety with "SATB" error in legend. Toned. 1820,BRAZIL. 960 Reis, 1820-R. NGC MS-63.KM-326.1; LDMB-P478. 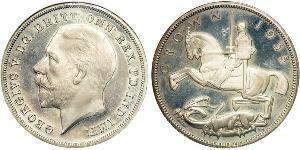 Struck over a Chilean "Volcano" Peso (KM-82.2). Toned with flashing underlying luster. 1820,BRAZIL. 960 Reis, 1820-R. NGC MS-63.KM-326.1; LDMB-P478. Toned with good luster. 1820,BRAZIL. 960 Reis, 1820-R. NGC MS-65.KM-326.1; LDMB-P478. 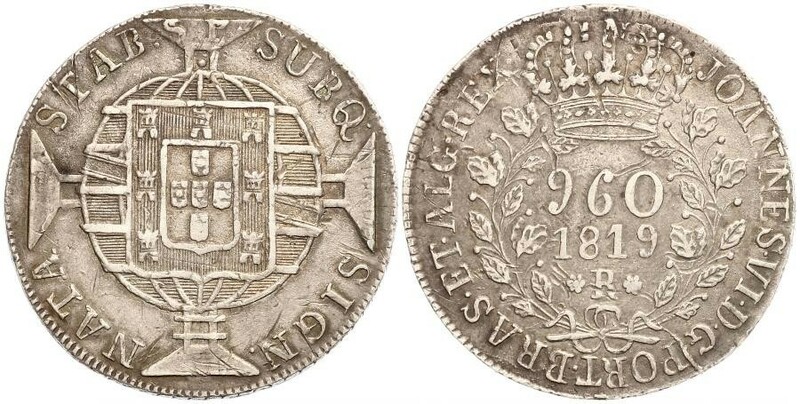 Struck over a CAROLUS III Spanish colonial 8 Reales. Well struck and very appealing. 1819,BRAZIL. 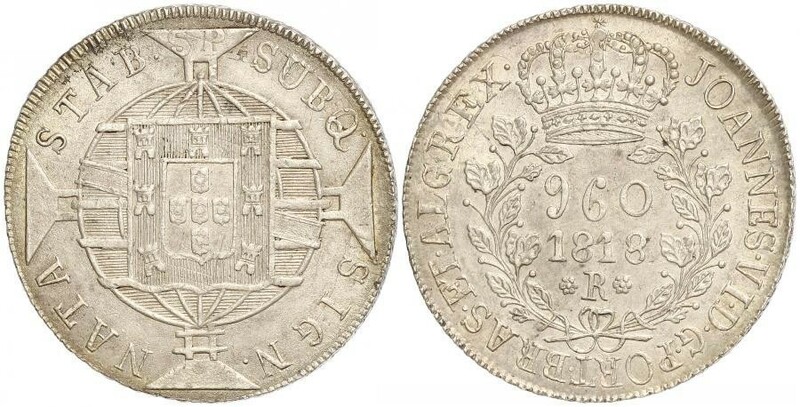 960 Reis, 1819-R. NGC MS-62.KM-326.1; LDMB-P477. 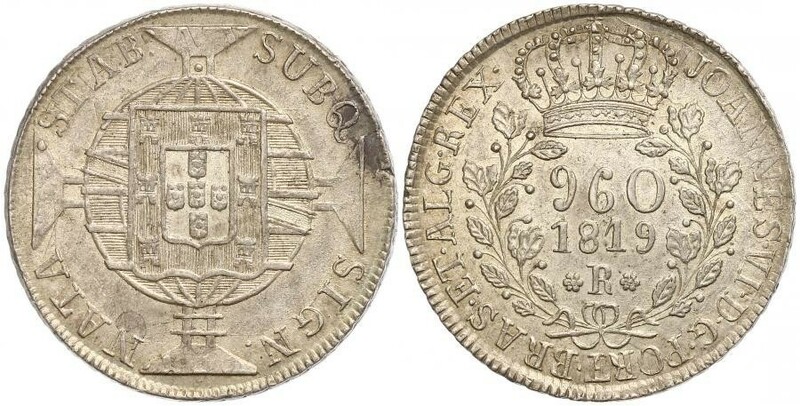 Struck over an 1815-FJ Chilean 8 Reales with a clear underdate and mintmark. Toned with some luster. 1819,BRAZIL. 960 Reis, 1819-R. NGC MS-65.KM-326.1; LDMB-P477. 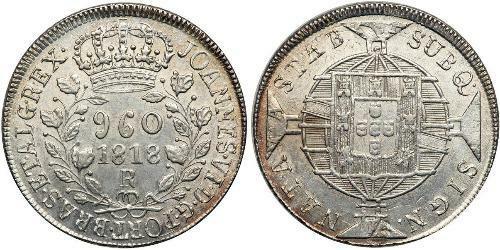 Struck over a Peru LIMAE JP colonial 8 Reales. Excellent strike, superb quality. 1819,BRAZIL. 960 Reis, 1819-R. ANACS EF-40.KM-326.1; LDMB-P477d. Seven berries on left branch. 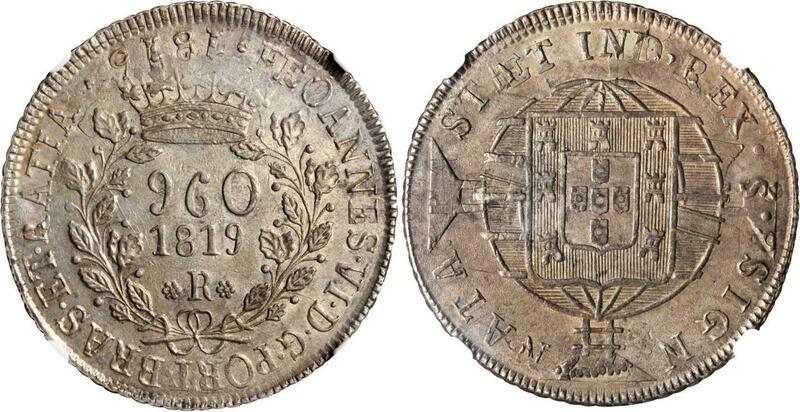 Struck over a Spanish colonial bust 8 Reales. Attractively toned. 1820,BRAZIL. 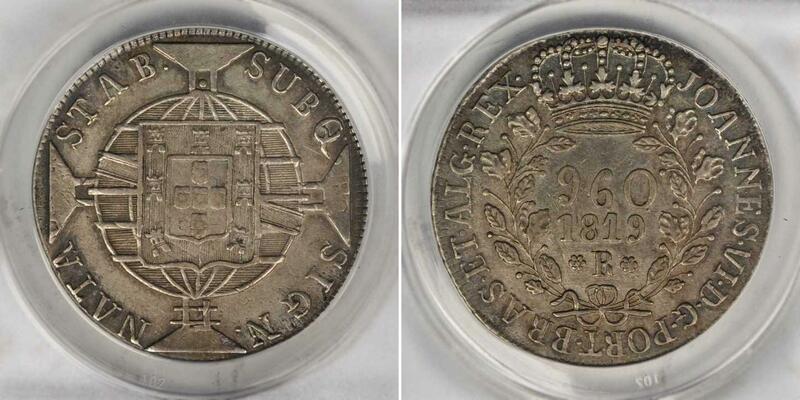 960 Reis, 1820-R. NGC Unc Details--Surface Hairlines.KM-326.1; LMDB-P478. Slightly bright from cleaning. Some verdigris deposits. Dramatic overstrike. 1819,BRAZIL. 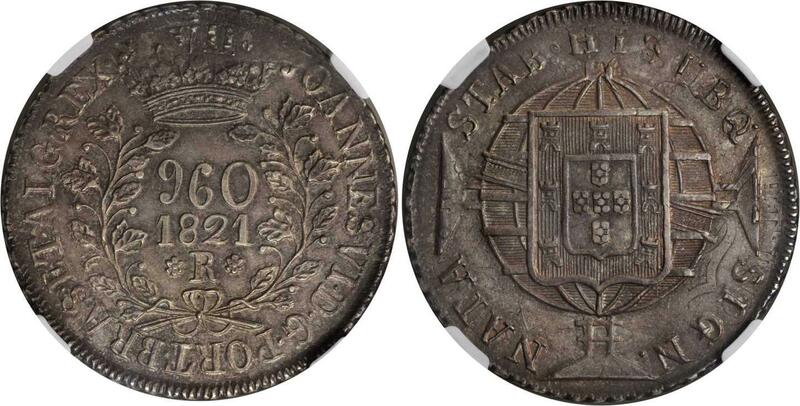 960 Reis, 1819-R. NGC MS-62.KM-326.1; LDMB-P477; Gomes-J622.05. 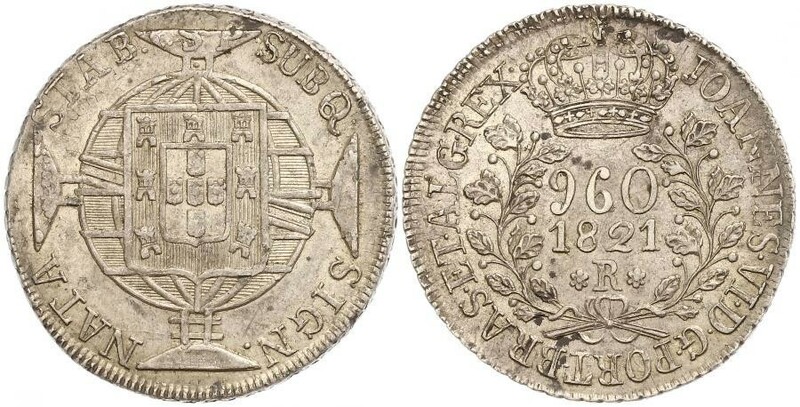 Overstruck on an 1808 Mexico City 8 Reales. Nicely toned with underlying luster. 1819,BRAZIL. 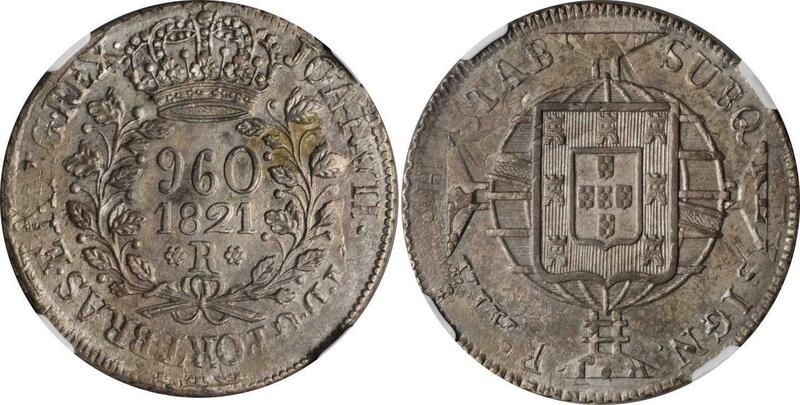 960 Reis, 1819-R. NGC MS-62.KM-326.1; LDMB-P477. Lightly toned. 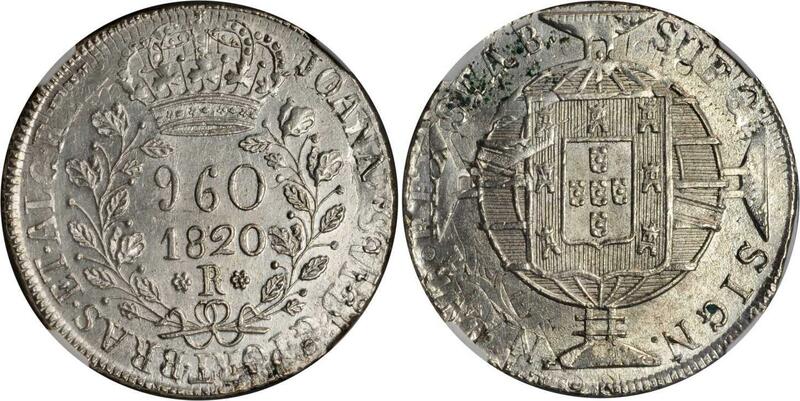 BRAZIL, Joao (John) VI, nine hundred and sixty reis, 1819R (Rio mint) (KM.326.1). Extremely fine.